The 2017 Customer Waiting List is Now Open! I have finally added a Customer Feedback Page to this site. Classic American Clothespins is a small, home-based business with a big mission. My family and I are bringing the manufacture of high-quality, spring-and-wood clothespins back to America. 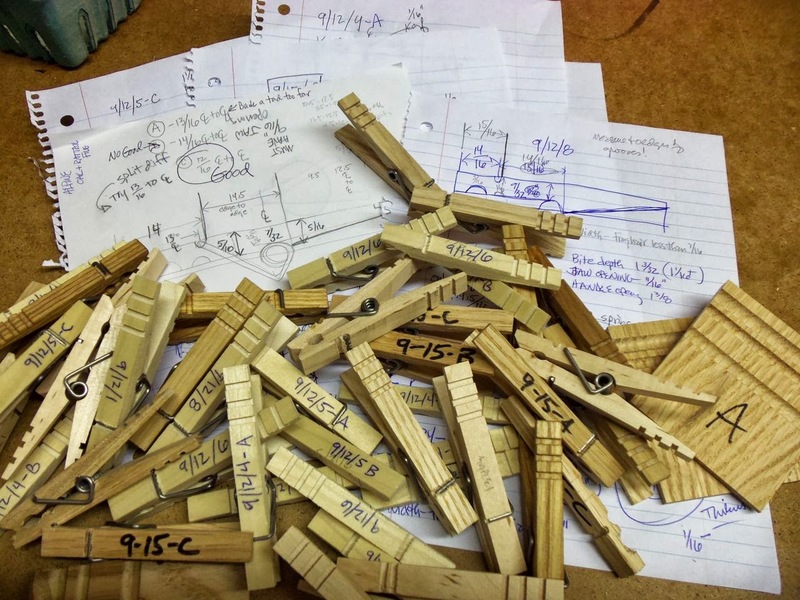 Our goal is not to be an enormous, centralized clothespin manufacturing company, but to re-introduce a well-made, useful clothespin and encourage the small-scale, decentralized production of these clothespins by entrepreneurial woodworkers all across the nation. In 1887, Solon E. Moore, from the state of Vermont, was granted a patent for a new clothespin design (Click Here to see the patent drawing). It consisted of two "wooden levers" held together with a "coiled fulcrum" spring. Out of some 146 other clothespin patents granted between 1852 and 1887, Moore's alone has stood the test of time. So it was that the quintessential clothespin was born in America. And for many generations, numerous American manufacturers produced many millions of hardwood clothespins with strong, dependable springs. However, 100+ years later (2002), with the closing of the Penly Clothespin Company in West Paris, Maine, only the National Clothespin Company, of Montpelier, Vermont, remained. Then, five years later, National shut their operation down. 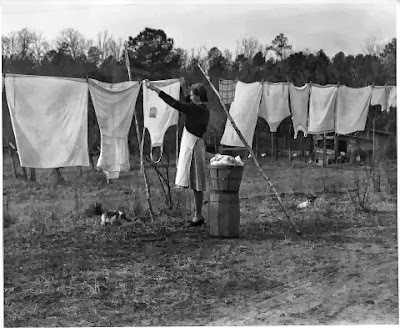 In the end, American clothespin manufacturers were driven out of business by a flood of cheap, Chinese-made clothespins. Imported clothespins have weak springs and come apart easily. 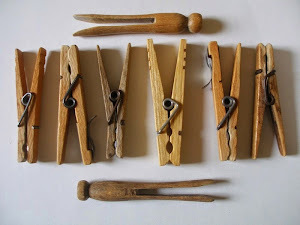 Imported clothespins are cheap in price and cheap in quality. Anyone who hangs clothes with them knows it. The wood is soft and weak. The springs are wimpy. 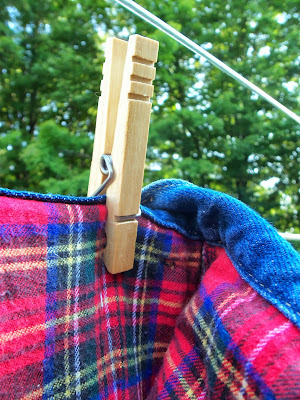 Such clothespins are discouraging to use because they don't hold clothes on the line dependably, and they break easily. Plastic clothespins are hardly any better. They degrade and eventually break when subjected to the ultraviolet rays of the sun. In the spring of 2012, my wife complained to me about the poor quality of a package of imported clothespins she had recently purchased. It wasn't the first time I had heard the complaint. But it was the first time I really paid attention. What got my attention was when she said that I should make a better clothespin. 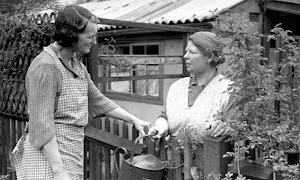 I guess she figured that if I can invent a Whizbang chicken plucking machine, and a garden wheel hoe, and a cider press, and other down-to-earth tools, then I ought to be able to make a decent clothespin. I was intrigued with the idea. After a little research, I came to the conclusion that there was universal dissatisfaction with cheap, imported clothespins. 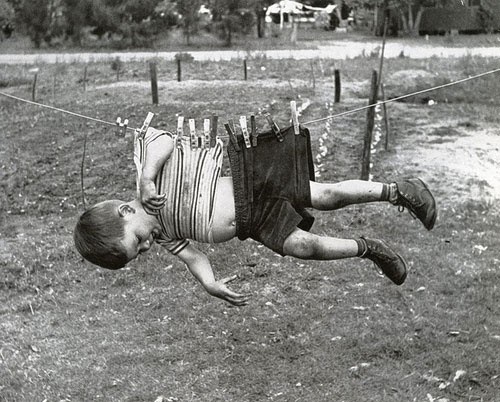 I figured somebody should bring the manufacture of quality clothespins back to America, and that somebody would be me. Why not? I found an American spring manufacturer who would work with me on the project. I purchased 50,000 heavy-gauge, tight-coil, custom-made stainless steel clothespin springs. Then I spent the rest of 2012 working on a clothespin design—a new Classic American clothespin design. 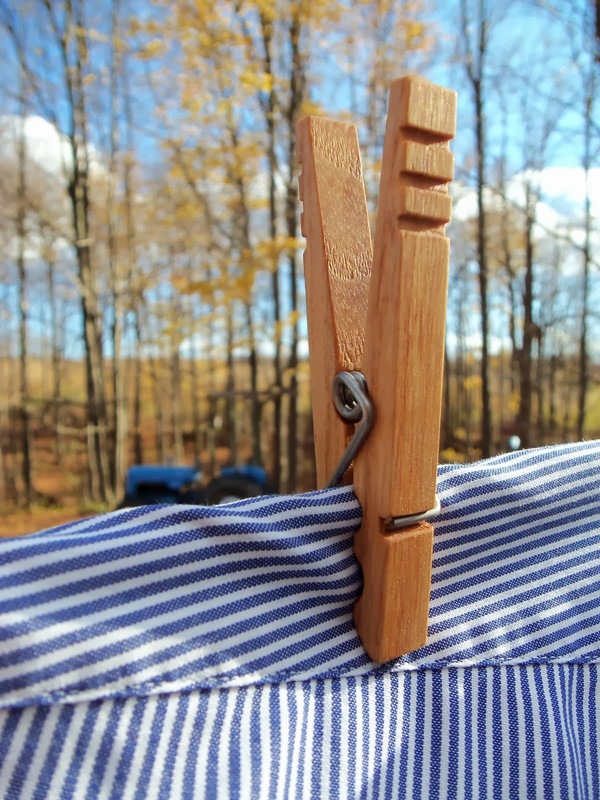 In the fall of 2013, nearly a year and a half after deciding to bring quality wood-and-wire clothespins back to America, I made the very first Classic American clothespins. Those clothespins (approximately 12,000 of them) sold out remarkably fast, and the customer feedback was remarkably positive. The heart of a great clothespin—a clothespin that will dependably hold clothes on the line—is a quality spring. In the picture above you can see the spring on a cheap, imported clothespin (left) as compared to a Classic American clothespin. 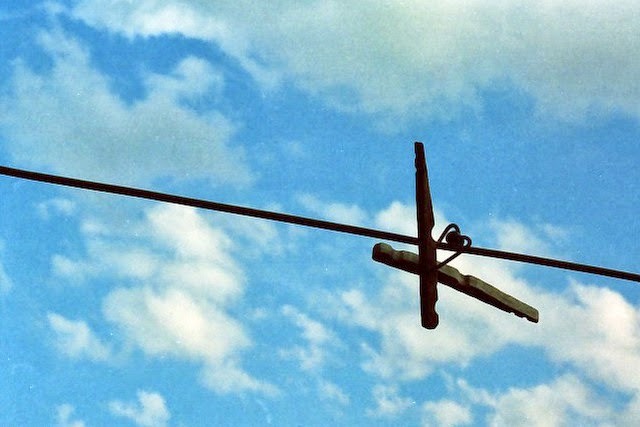 The Classic American spring is a heavier gauge of wire. Note also the skimpy coils on the imported clothespin, as opposed to the fully-wound spring on the Classic American. The heavy wire gauge on my clothespins is the same as that of a particularly good old clothespin that once belonged to my mother. But instead of using a spring made with standard steel, I opted to have my Classic American clothespin springs made of stainless steel. As far as I can determine, stainless steel has never before been used to make a traditional-style clothespin. 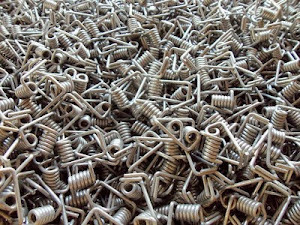 Stainless steel springs are, as you might imagine, more expensive to make, but I wanted a spring that would never rust. Traditional clothespin wood is either birch, beech or maple. Such hardwoods are durable, have a uniform light-colored grain, and do not bleed tannin stains onto clothing. 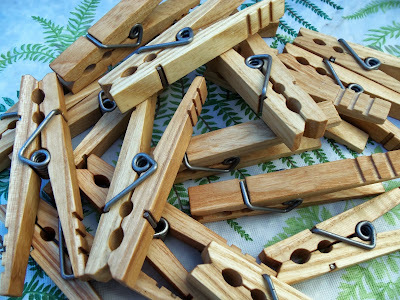 I have no idea what kind of wood is used to make the cheap imported clothespins. It is Asian mystery wood. Classic American clothespins are made of ash lumber. Ash is a North American hardwood with high strength and excellent weathering qualities. Ash is commonly used for tool handles. It is a beautiful wood with a distinct grain, and the color varies from white to very dark. It does not bleed tannins. I chose ash because of it's ideal physical properties, but also because it has such a distinct grain, which darkens to a lovely patina with the passage of time. 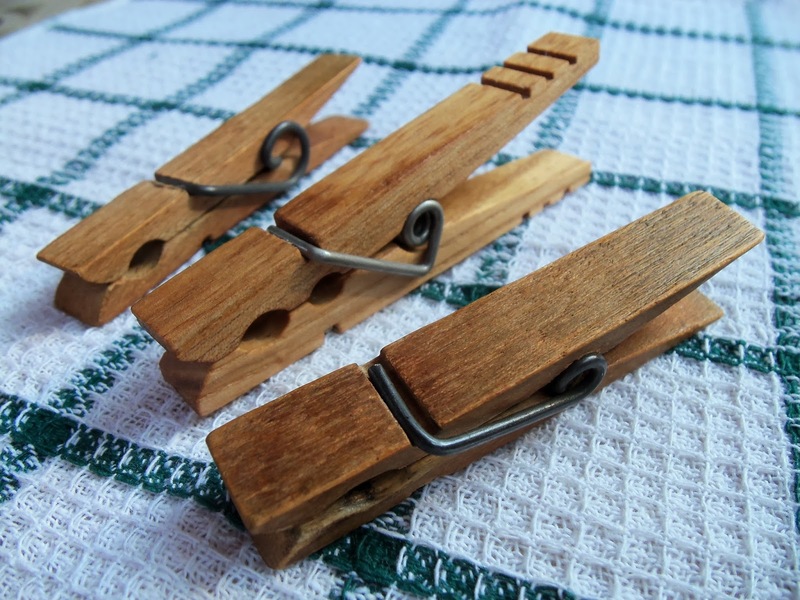 As a result, Classic American clothespins are simply beautiful—each has its own natural grain "identity." These clothespins have character like no other clothespin I've ever seen. The picture above shows a dark-grained Classic American clothespin flanked by two old clothespins that have, over the years, developed the lovely dark patina that comes only with age (and care—those clothespins weren't left outdoors when not in use). 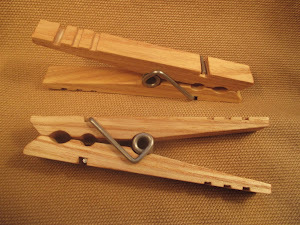 The picture serves to show three distinct differences between the Classic American clothespin and the typical old-style pins. First, take note of the "grip-grooves" in the Classic American pin. 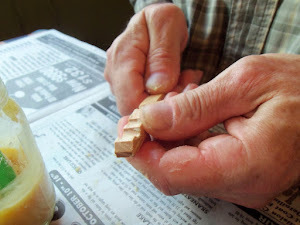 When you grasp a clothespin with grip grooves, your grip is more sure. It's a practical feature, as well as an aesthetic one. Another difference with the Classic American is that the gripping ends of the pin are further apart than on the old-style clothespins. This extra distance makes it easier to grasp and operate the clothespin. You don't have to pinch-squeeze it with your fingertips to open it. You can, instead, grasp it between your fingers and palm to lever it open. This makes opening the clothespin easier for people who don't have a lot of fingertip strength. And finally, you can see in the picture that the Classic American clothespin has more "bulk" to it. Total length of the pin is 3-1/2" (a bit more than usual) and there is a greater thickness to the wood. It is a substantial clothespin—but not awkwardly large. As you can see, Classic American clothespins are not cheap in quality. 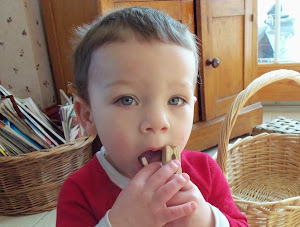 On the contrary, they are the highest quality wooden clothespin I know of. But they also aren't cheap when it comes to cost. At $2.20 each, my clothespins are downright pricey. In the final analysis, Classic American clothespins are made to be used, and to be cherished for their simple and dependable usefulness. They are thoughtfully designed, and carefully crafted to last a lifetime. I think old Solon E. Moore would approve. 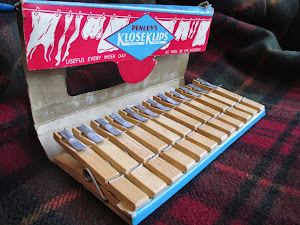 I hope you'll try some of my clothespins, and then let me know what you think of them. Customer #106 (Susan C. in Michigan) will be contacted next. The 2017/2018 waiting list is still open. Please CLICK HERE for complete details about how you can get on the list. The status of the customer waiting list will be updated here as it changes. Yes, my clothespins are worth waiting for. 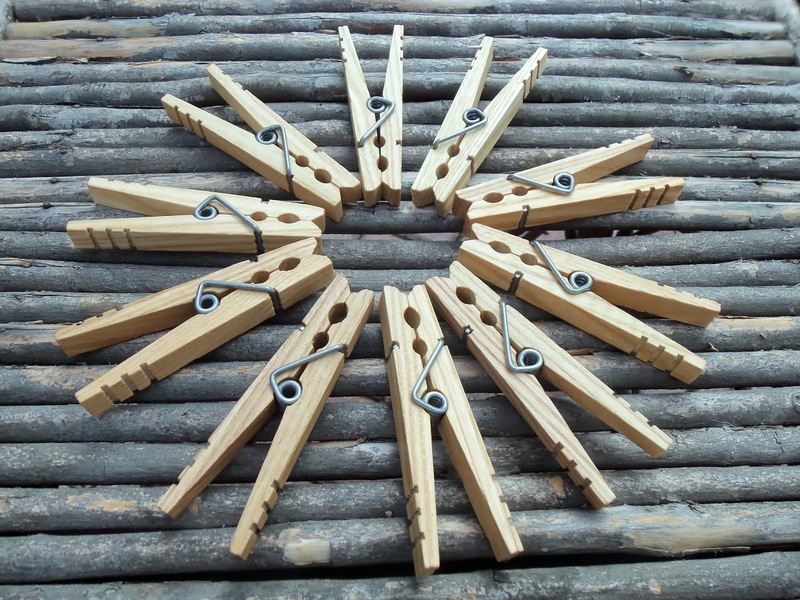 You will not find a better quality, traditional style, wood-and-spring clothespin in the world. P.S. 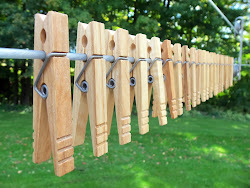 Two-clothespin sample packs of my Classic American clothespins are still available at This Link. Click the picture and read some of the Classic American Clothespin feedback we've gotten. 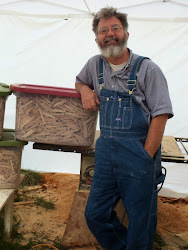 Click on the happy clothespin maker to go to the Home page of this web site, and read my story. "Sir, You are correct! Your clothespins ARE worth waiting for. Seeing how I still have what I assume is a long wait, I'll be content with my second sample pack until I receive my order. Thank you, thank you, thank you for making such a quality product." 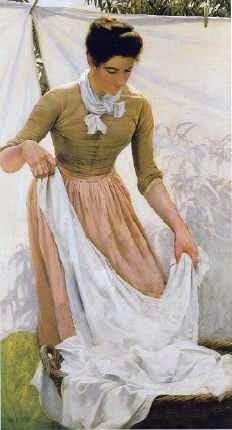 click the picture for an old clothespin wax recipe. "Just wanted to send you a note to tell you how much I appreciate your work. It seems just shy of crazy to get so worked up over clothespins but what I have before me is nothing short of perfection—each clothespin is a mechanical work of art and unique. They are beautiful, practical pieces and I admire and value the efforts you have made to create them." 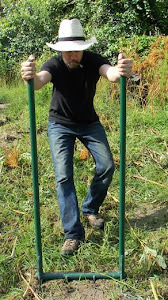 If you are an experienced woodworker, looking for a nice little project (or a money-making idea), click the springs. 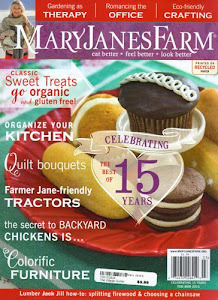 Click Jane's Pins To Read The Review. That's him in the picture. Click the white hat to read his review. 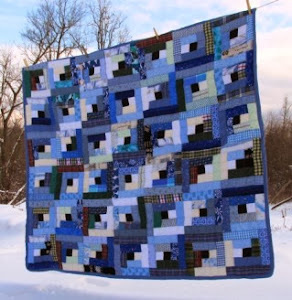 Click on her handcrafted quilt to read the review (and to learn about her handmade clothespin bags). Thank You to Linda Holliday For Blogging About Classic American Clothespins at Mother Earth News! Click the old package pf Penley clothespins to tour an online clothespin museum. Copyright, Herrick & Marlene Kimball, 2013. Simple theme. Powered by Blogger.